Arthur Ebirim, 45, from Peckham, south-east London, was overcome by the killer gas on 28 October 2011 as he kept a night-time watch over a disused nursing home in Taunton Vale, Gravesend, that was awaiting demolition. His employer Anchor Services (GB) Limited was prosecuted on 13 February by the Health and Safety Executive (HSE) after an investigation identified serious flaws with how the generator was used. Dartford Magistrates’ Court heard that Mr Ebirim and colleagues had been assigned to security at the nursing home since early August 2011. The guards were initially stationed outside the building before moving into a lobby area inside as the weather cooled. 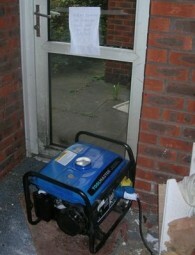 The petrol generator belonged to one of the workers and was also placed inside the lobby to provide a power source. On the evening of 27 October Mr Ebirim was asked to guard the home alone because the usual night-time guard was unavailable. His wife raised the alarm that something was wrong when he failed to contact her at the end of his shift the next morning. Company representatives went to the site but were unable to gain access to the office. The door was eventually broken down by the emergency services and Mr Ebirim was discovered slumped in a chair. He was pronounced dead at the scene before a post mortem later confirmed carbon monoxide poisoning as the cause of death. The court was told that Anchor Services (GB) Limited failed to assess the risks posed by the generator and also failed to implement its agreed lone working procedures on the night of Mr Ebirim’s death. The company, formerly of Tanfield Road, Croydon, but now in the hands of Sutton-based liquidators Turpin Baker Armstrong, was found guilty in absentia of breaching Section 2(1) of the Health and Safety at Work etc. Act 1974. It was fined £20,000, the maximum penalty available to Magistrates, and was ordered to pay a further £35,656 in costs.